Understanding the perspectives in a balanced scorecard is fundamental to their correct use. The balanced scorecard perspectives create the cause and effect relationship that tells the story of the strategy. These articles look at the various perspectives, explain their use and help you avoid the most common mistakes when using balanced scorecard perspectives. A guide to the individual perspectives: Customer, learning and growth, financial, process and environmental. The perspectives create a cause and effect model that is used to describe how the strategy will create change. That cause and effect model is captured by mapping the strategy and creating a strategy map. Do not start with measures. Start with objectives. The perspectives contain objectives, not measures. The measures are added later. If you want to understand this, I recommend you watch my video Strategy Mapping 101, or carry on reading this post. People ignore the cause and effect relationship. They simply add more perspectives because they sound useful. This just leads to a complex categorisation on measures that are unrelated. To understand why this does not work, watch our Strategy Mapping 101 video. They mis-use or rename the perspectives, losing their purpose and value in the process. This is another way to achieve the problems created in (1) or (2). Unfortunately, it creates a complex categorisation and often destroys any story of the strategy and the cause and effect model. Here are some articles explaining specific aspects of each perspective and some typical problems that are created when the perspectives are ignored or renamed. I also put a values perspective underneath the Learning and growth perspective. Back in 1997, whilst doing the strategy for a large UK retailer, I realised that adding the values perspective, acted to anchor the learning and growth perspective and stop it being simply “this year’s set of development fads”. The financial perspective is usually the simplest to create. In commercial organisations it contains the financial outcomes and the results of what the organisation costs and the revenues that the customers provide. In not for profit organisations, you also look at donations and sources of income, as opposed to customer sources revenue. I often get some odd questions about the financial perspective. Here are the most common ones. Why isn’t the financial perspective at the bottom of the strategy map? Does the Balanced Scorecard need to consider financial capital in the Learning & Growth perspective? It is common to now include an environmental or social perspective in the top part of a strategy map. It represents the impact and outcomes that the organisation has on the environment. We have been doing it for our clients for years. The customer perspective: Talking in their voice. Of course, if you are not clear who your customers are, or what they want, this perspective becomes difficult to create. The clearer you are about what your customers really wat (not what you think they want) and the clearer you can put it in your voice (not organisational marketing speak) the easier it is to develop their objectives in this perspective. The process perspective is the least tricky and most obvious. It is obvious, as long as you put in genuinely useful objective statements and avoid vague and meaningless “Manage this” phrases. You put the meaningful objectives for the processes in that perspective. It is helpful is these are arranged in a meaningful process across the perspective. You have to ensure these are supported with a cause and effect relationship to the Learning and Growth perspective, and that these processes support the customers objectives and the financial objectives. This perspective contains the fundamental driver of change in the strategy. Omit the learning and growth perspective, or fudge it, and you have strategy by hope and magic. I am sure you do not want that. 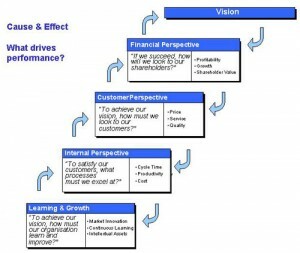 Why call your balanced scorecard perspective “Learning and growth”? 3.8 A note on risk management and a risk perspective: Put simply, don’t! Some people like to add a risk perspective to the strategy map or scorecard. Please do not. You are boxing risk measures into a single isolated criteria, when there are multiple different types of risk, of which you can choose to measure and monitor various aspects. Just think for a moment, given a cause and effect model that describes your strategy, does risk sit an any one level? Of course not. Simply adding Key Risk Indicators (KRIs) does not work either. To understand how balanced scorecards and risk work together, and what classes of risk a strategic balanced scorecard approach will, and will not, be useful in managing, read our section on Balanced scorecards and risk in the Fourth Generation Strategic Balanced Scorecard section. The important piece about the perspectives is that they have a cause and effect relationship across them. This is the core underlying model, upon which to develop the story of the strategy and describe change. If you want to understand perspectives and cause and effect better, then have a look (if you have not already) at my Strategy Mapping 101 video. I have produced a series of articles that help people better understand how to design, implement and use modern balanced scorecards, be they operational or strategic. They are all in the “Modern Balanced Scorecard Zone” The series of articles explain the variety of different things that get called a balanced scorecard and the different purposes of different types of balanced scorecard. The design principles behind Kaplan & Norton, Strategic Balanced Scorecard approach done properly. If you want an approach that suits the challenges and paradigm shifts of today’s organisational have a read of our Fourth Generation Strategic Balanced Scorecard approach.